The Stoewer company on the Falkenwalderchaussee in Stettin built its first motorcar in 1898. Prior to that time, they had already manufactured a lot of bicycles and motorcycles. Father Stoewer owned the company, but his sons Bernhard and Emil were responsible for the motorcars. The first Stoewers were powered by two-cylinder engines, but as early as 1902, the company launched one of the first German four-cylinder engines. It also proved to be a reliable engine. Bernhard Stoewer drove one of his cars from Stettin, on the Polish border, to Paris and back and that down roads which hardly deserved that name and without maps or petrol stations. In 1906, Stoewer was the first German car make with an 8831 cc, six-cylinder engine. In 1911, the engine was built into the Stoewer P6. Up until the twenties, the company specialised in cars with four-cylinder engines. Most engines were side-valves engines, only the F4 (1912-1916) and the R 180 (1935) were equipped with overhead valves. The same applied to the Greif Junior, Sedina and Arkona all manufactured immediately before the war. 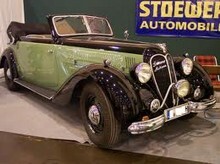 Up to 1940, Stoewer sold a total of 25,130 passenger cars. During the war the factory was thoroughly destroyed by Allied bombers. So thoroughly in fact that it could not be rebuilt. Once again another famous make had disappeared from the market.